Dr. Dale Scharine’s patients are like his family. He has shared in many of their joys and sorrows and truly cares about them! He looks forward to helping patients improve and maintain their smiles throughout the years, and feels fortunate that they allow him to be a part of their lives. Dr. Scharine feels he could not ask for a better career as a dentist, or a better group of people to call his team. Dr. Scharine received his undergraduate studies at the University of Wisconsin-Oshkosh and received his Doctor of Dental surgery degree as a graduate of the Marquette School of Dentistry. 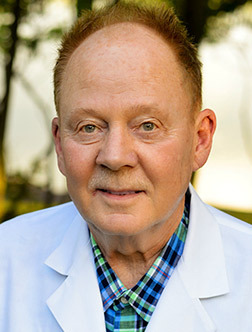 He is in involved with many organizations including the ADA (American Dental Association) WDA (Wisconsin Dental Association) AGD (Academy of General Dentistry), and the AAOGP (American Academy of Orthodontics for General Practitioner). Dr. Scharine thrives on learning, and keeping up with the latest trends and therapies in dentistry. He is dedicated to providing the best care for his patients, and his commitment to continuing education makes it all possible. When not at the practice creating smiles, Dr. Scharine enjoys spending time at home with family. He is married to wife, Reene, and has one daughter, Melissa, two sons, Dan and Paul, a family dog named Princess, and four grandchildren. His family resides in Appleton, where he’s been proud to call home for over 30 years. Dr Scharine enjoys jogging, hunting, swimming, and biking.